And so, we’ve come to the final Anime Weekly of the season (next week we’ll be doing season wrap-up). Some shows are done, others still have an episode to go, but it’s time to start thinking about where all of these shows belong in the grand scheme of things—and maybe start looking forward to next season. Owarimonogatari, Episodes 7-12 [END]: I made my way through the last arc of Owarimonogatari last Friday, and what a treat it was. This has always been a franchise that’s endeared itself to me more in chunks than in weekly doses, so I’m glad I decided on the watching strategy I did. 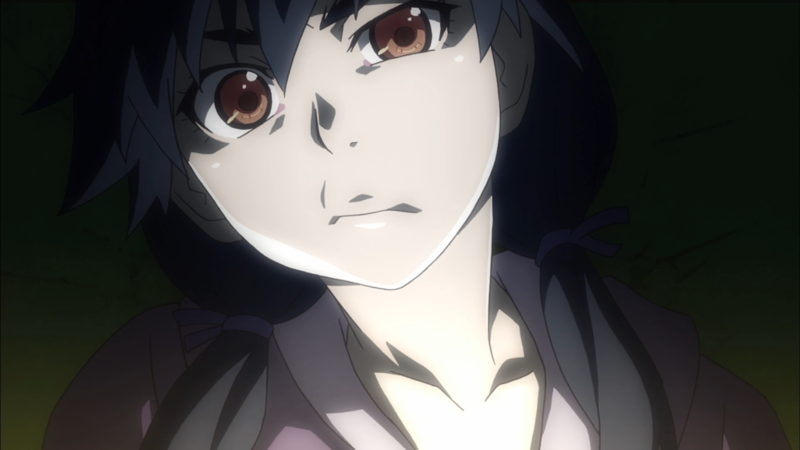 Highlights out of the final arc included Kanbaru and Araragi’s tangent-filled conversation in episode 7 (it feels like it’s been forever since we got one of these kinds of easygoing interactions from Monogatari), the return of Shinobu, Kanbaru and Shinobu’s argument, and Satsuki Yukino really going to town as Gaen (I didn’t remember her being this vocally engaging). A longer reflection on the entirety of the season is coming soon, but for now I’m really just happy to have Monogatari back in seasons, rather than in single arcs. Haikyuu!! S2, Episode 12: One of the things Haikyuu!! has actually been consistently good at when doing character writing is focusing on the other side of the net, on the losers who pave the way on the winners’ paths to the top. For a moment, I was worried Karasuno was just going to cruise past this match without the show pausing to take a look at their opponents, but happily my fears were unfounded. The match itself—other than the one long volley—left a lot to be desired in terms of excitement, but for once I felt like Haikyuu!! wasn’t just plain falling flat when trying to do character-based stuff this season. I’m still impatiently waiting a match that actually brings some tension to the screen, but this week was a step in the right direction. Also, Yachi. Gundam Tekketsu, Episode 12: Although this was an episode featuring a semi-important battle, I’m actually far more interested in next week’s episode: the aftermath. While Akihiro and Masahiro’s tragic ending was clearly supposed to be tragic, in this case I felt like Okada missed due to failing to give Akihiro enough depth as a character (and thus, the loss of his brother didn’t quite work). Which is interesting, because a lot of the other smaller character interactions, like Orga putting Eugene in control of the ship or Kudelia and Atra bringing Mika lunch, we spot on. Finally, I probably most appreciated how ignoble and lacking in glamour this battle was outside of the Akihiro Masahiro stuff. It’s kids fighting kids, and there’s nothing to be celebrate about that. Comet Lucifer, Episode 12 [END]: No surprises here (other than the revelation that angels can apparently child entire planets if they get enough power or something). Comet Lucifer pretty much hit all the beats you would expect a show like it to hit, leaving a bunch of the clean up to the epilogue (Kaon and Roman getting married with no further development was high irritating!). There’s really not much else to say—whatever you’d expect from Comet Lucifer, it did. Some fights, Felia remaining Sogo’s distant love forever, lots of yelling, some cool shots in outer space. A show clearly made with love, but lacking the chops to quite pull it all off. Concrete Revolutio, Episode 12: So, we’re back to arbitrary divisions between superhumans, truths, lies, and constructed realities. Basically, the same stuff Conrevo has been working with all season long. The Chief “protects” superhumans so that they can be controlled, and is a member of an alien species seeking beings who can evolve and become like them. Jiro is caught in the middle, a human who has been turned super (although he doesn’t know it). There’s an illusion surrounding him, but does the fact that it’s an illusion make it evil or wrong? Does the fact that Kikko’s has created her own fantasy where Claude is really Jiro, in order to not have to deal with her frustrations dealing with Jiro, mean that she’s wrong to do so? Is it wrong to the Bureau to protect a politician with dubious aims because some of his goals line up with theirs when they’re seeking to defeat Claude at the same time? You can dig down to people’s motives, but you might never find a real answer to that question. Not when everyone is pursuing their own fantasy, whether it’s constructed by others or themselves. Miss Monochrome S3, Episode 12: In which Miss Monochrome rides a tiny robot vacuum up a snow-covered mountain and then back down again. K: Return of Kings, Episode 12: The show’s mostly given up the ghost at this point. Tension’s at an all-time low despite the fact that the final battle is next week and—generally speaking—I’ve kind of lost interest. I tried so hard, but without Shiro-Kuroh-Neko as the focus, the show just feels empty. Noragami Aragoto, Episode 12: Likewise with Noragami. When all you have to do is shounen yell down a whole to resolve a problem that’s been 3 episodes in the making, there’s not a lot to get excited about. One Punch Man, Episode 12 [END]: I suppose the fact that I forgot to even write about One Punch Man says something about my feelings on this finale (and the show as a whole). A lot of flash, but not much to remember besides Yutaka Nakamura killing it. It’s a bit disappointing when Haikyuu and Noragami, the two sequels I was so looking forward to, turned out so meh in the end 😦 At least the Bishamon arc was great! And Yachi! Gosh, Yachi is just soooooo cute. I’m going to have to disagree there. Noragami’s first season was okay, I suppose, but the second season was so much more emotionally charged and thematically rich, with a focus on consequences and history that few anime ever pull off. If anything, Season 1 was meh and 2 was great. Yeah, it’s sad, but you’ve just pointed out the redeeming highlights. Yachi is the sun of this season, that’s for sure. In other news, I’m in the middle of a rewatch of Yuuki Yuna… And it’s actually pretty rough going, seeing all the foreshadowing that pretty much everyone missed until Ep 7 pulled the curtain back. I’ve watched YuYu three times now – once as it aired, the second time marathoning it again just a few days after it finished, and the third time a few months ago after I finished buying the Blu-Rays (I watched the dub version for that playthrough, and it’s actually pretty good). Even knowing what was coming, the show lost none of its impact for me, and it really made me appreciate how carefully plotted and laid out everything was – like you said, there’s a ton of foreshadowing all over the place. And scenes like Togo in ep 7 telling Yuna how she starts having dark thoughts whenever she’s alone, or Fu in ep 3 teasing Karin about still being a “level 1” character when Karin admits she hasn’t used Mankai yet, really take on a completely different tone when you know the whole story. Very much worth it though. As with my rewatch of Eupho and as you say, it really shows how well everything was thought out. Ah, once again the difference in watching schedules bites us! Hopefully next season our choices will align a little better! Enjoy Gundam! It’s pretty solid! If our tastes were the same, this wouldn’t be nearly as fun! It was a bit of a struggle to get her to watch it at first because she believed Gundam=Mecha=Endless Fighting And War… But we’re both enjoying the heck out of it. @Monogatari: It’s interesting to hear you say you’re glad to have Monogatri back in seasons rather than in single arcs, because I’m the exact opposite. For me, Monogatari works best in small doses: the constant cuts are irritating and make it hard to concentrate (since I’m a scatterbrain anyway). And after a while, they’re just talking too much. After the very first season, there wasn’t a full-season Monogatari that I didn’t consider dropping. I never did, and there were always those very, very strong scenes that made all the tedium and irration worthwhile. The most recent was the stellar Kanbaru/Shinobu scene. And it’s not like you can just skip forward to the great scenes, because you need all the build up. I think Mogoatari is just working against my instinctive attention span. Watching it is hard work and the pay off is mostly delayed too much for my taste (but usually worth it). @Noaragami: If all you saw in that scene was shounen yelling down the hole, then we’re watching different shows. I mentioned last time that I was re-watching random shows and one of the mentioned shows was Nekogami Yaoyorozu. In that show a lazy and irresponsible cat god gets kicked out of Takemagahara and gets taken in by a antique dealer. Moe antics ensue. In one episode a god of poverty visits town and the town’s guardian deity errects a barricade against her. Meanwhile antique dealer casually picks up the god of poerty and gives her meal. The god of poverty spares the city and leaves. Antique dealer says something which I don’t remember, and our cat god goes into her very rare serious mode. She says that you have to take the good with bad. Where there’s a god a fortune of fortune, there has to be a god of poverty. And nobody wants that job. Yato’s insecurities about his true name reminded me a lot of that. And the issue hasn’t yet been resolved. At the same time, I agree that the current arc isn’t really as elegantly written as the Bishamon arc was. Well, I suppose it is a bit dishonest of me to say I like Monogatari being back in seasons when, in fact, I watched it in two batches of 6 episodes (the two different arcs). But I really don’t like it on a weekly schedule, so maybe having it in seasons is more just me saying that I like getting a lot of it to watch at once (rather than just a handful of episodes). I have a feeling that Jin is going to be an important piece in opening up the show next week going into the second cour. Super stoked about it. I’m curious what you found “tropey” about Hiyori knowing Yato’s real name. I thought the kanji explanation was pretty reasonable. Hiyori made a shrine for Yato, the shrine works because Yato’s real name is inscribed on it, the only way that works is if one of the characters inscribed is identical or really close to another character. This is how Hiyori figures out Yato’s name. You could make a similar puzzle in English out of homophones. Given the importance of names and naming in Noragami, I thought it was an appropriate resolution for the show. Ohhhhh so that’s how she knew. The kanji thing did not make its way across to me (thanks to Funimation, perhaps?). I had been under the impression that she just somehow “knew” it. But your description makes sooo much more sense. It still strikes me as slightly contrived, but definitely to a lesser degree than it did before. With Haikyuu, it seems to be the wall hit by many sports series when they finished establishing the team and got past the first tournament arc. Just struggling to sustain momentum and find new source of drama beyond refinement of the team; those training camp episodes in particular seriously lack the spark of individual arcs in S1. Well, it’s tourney time now, and this being the third-years’ last chance should provide some much-needed dramatic boost. Besides that, gonna continue w/ Osomatsu and Gundam as they carry over, I’m enjoying them. None of the other shows I’m watching that ended this season had impressed me much; wouldn’t really recommend Sakurako or Young BJ, and Perfect Insider irritated the hell out of me by the end. That show could’ve used less episodes, less deitification of certain character, and less philosophical mumbo jumbo that just didn’t goddamn work within its context. Here’s for the new year and for Showa Genroku, Boku Dake and Dimension W to deliver for me. I haven’t seen all that many sports shows (or manga), but the struggle you’re describe does seem like a logical problem for this kind of story to hit. Like you, I’m just continuing to hope that the tourney and everything going along with it will help inject some tension into the show. I’m super pumped about Dimension W! The staff is probably the best working on any show next season. What happened to One Punch Man? Whoa! I totally forgot somehow! I’ll add it in now! I will post how I thought about this week and is a Final I will incude all 37 shows ! Also the seasom had some really good shows / and some letdowns / but winter looks good on paper /A lot of good 2nd cour shows again. BOTH ANIMES ARE THE SAME Basically / Just change the names-weapons / Both of these have put me to sleep so many times. EPISODE of the SEASON ? Meanwhile Guren is being tortured by other nobles . It is revealed to Crowley from Ferid that Guren is behind the ataccks and a deak between humans and vampires to stop the Seraph of the End . The deal was between Krul / Mahiru Hiragi. Guren’s ex love / demon weapon which comes to life to kill the nobles that are beating him. Krul wants to know where Mahiru is and he tells her. Crowlet forgive Ferid / Krul because he had fun and senses ther is a bigger picture to be seen! Back at the Airport the MDC doent leave because planes from Japanese Imperial Demon Army arrive however Kureto Hīragi and Aoi Sangu prepare to hatch the Seraph after asking / insulting MDC ans say they are going to die ! Guren’s squad / Shinoa survive at first after the Seraph spears most of the humans with chains . Shinoa is spared as a family member but refuses to go along and is about to killed when Yu / Mika show up . Also Krul and her Vamps show up and and a big battle will begin ! BTW who are the good guys / its family vs family in severasl instances> There are just as many ad humans as vamps ! Should be exciting next time . Shomin Sample EP 11 / Is This Not the Sky That Kimito-sama Was Looking At? Reiko / Kimito are called away to the president’s office to find out Reiko has to leave school for a an arranged marriage but Reiko doesnt seem happy and not her friends at The Commoners Club ! Hakua unlocks the Cell Phones and despiye all their spats Aika calls Reiko and they miss each other and Reiko wants to come back ! A plan is hatched with Reiko’s brother who is against the marriage and off they go to rescue Reiko ! MM is wearing her Mascot costume and is gettting quite popular at a ski resort ! A fan Kita Umio wants his finacee Hokkai Michiko to see MM but is stranded in a snowstormm Of Course MM goes to rescue her and comes upon the hidden Battery Trasure cave which has MM in a game. She finds Hokkai who is very cold gives her the Mascot Suit which makes headlines and the suits sell like crazy! The orgin of the Kagewani is revealed > The remains were scattered over the earth and created new monsters which Kimura and his lab made new ones to make weapons But one gets loose at the lab ! Kimura retreats into a safe room but Banba is wounded and looks like the monster attacks him but Banba is immortal? DISCLAIMER / I hear the manga was quite different for this EP / So I am basing on what I watched / I may have to go read it ! But I enjoyed it anyhow! And this was before I got to this forum! I am just in awe how good this EP was in a season that never faltered ! Yato / Bishamon / Aiha / Kazuma are bound up and Izana is trying to get them to eat underground food so they wiil stay there and or have them consumed but they escape leaving just Yato behind ! The only way fcr Yato to escape is to call him by his real name Yaboku.which is something terrifying and fears it would drive Hiyori / Yukine away but Hiyori remembers and gets him up But more trouble when The God “Hit Squad comes led by Takemikazuchi ans see the vents letting phantoms out and they want to kill everybody! Ebisu fights back but is defeated . Bishamon and the others try and they defeat Kiun his Shinki . Finall they have a pacification ring which will destoy eveything around they fire one off and it exposes everybody but Yato / Yukine blast it and the gods all over. But Ebisu is trapped by a ring and wev dont jbow what is up ! Munakata is about to lose at the hands of Iwea when he is disrupted by the crash and then the support of Scepter 4 which is also policing the country to quell things down. Once Munakata regains his composure he kills Iwa But he is losing control of his sword and Awashima will step in if neccessary ! 2 The main focus is the rescue of Fujishima by Yata who thought he was a traitor but Munakata ordered him to do so even if meant dying ! Yata is more upset about not knowing thinking they had become some what friends ! They have to battle Gojou who is winning but is distracted by collateral damage and is defeated ! The rest of Homra has taken down the outside guards ! 3 Just starting Shiro / Neko / Kuroh are on their way to Nagare when Yukari stops them . Kuroh takes point rather than Shiro as this an ongoing grudge match! Can I say this real interesting now focusing on the batlles / high tech ! Bilany Saronno part of Bright Hoppers’ support group wanrs to blow up a dam to stop but it would kill tens of thousands The 37 th is against this plan and sruggle to come up with a plan which they do because there is 3 MT passes to go through. The Lisolette Railgun Shell is shot up in the air but then starts falling and splits into 3 shells fired by rockets then deplots several more rounds. One thing there is design flaws and the shells air detonaed saving more damage ansd life. Frolaytia continues to be a strong leader and while waiting for the Lisolette Quenser asks Frolaytia about her nobillty which she doesnt like If not for the military shee would be used to marry maybe even more than once since mosy of the nobel families are born male In fact Halreed Copacabana pilot of Bright Hopper is 3rd in line to ask for her union! Shw would either rather die out in the field or grow old than to be used!social political power ! The Railgun Shell is just devasting ! BTW One Shell can cover 1/6th of the Earth’s surface! This was a good intro how Black Jack came to be . Withh all the jealously / power grabs / war social injustice and non caring of those in power ! This last EP with the student activisits was a sad one. Eri one of his first patients who he stiched up and didnt leave a scar is getting in too deep with radical students who have guns .She gets beat up badly by her co-horts , Hazana went looking for her after hearing about raids in a MT area where Eri sent a postcard from . He finds them and has to save her. But the police surrounf the cabin and a shootout begins ,Hazana tries to stop a weak Eri frm stopping the gun fight but smoke hrenade comes in . She goes outside and she gets shot and dies . Hazama is cleared of any wrongdoing and become an intern but decicdes to go underground! Atomic Samurai continues the fight with Melzalgald who is distracted by Band then Atomic slices him up and Bang crushes his heart OPM returns and Boros releases his Planet Buster Roar Cannon bu OPM counters with Serious Strike.defeating Boros fatally. His dying words were this was the best fight and both agree ! Metal Knight shows and salvages the ship but rebuilds the city and HQDRS which is stinger now because the ship was super alloy . Taki / family from the Strange Risk MGNT Office are good snoops ! This was a fun interesting Episode ! It was reallt the first time the craze of drones / hoverboards were used . The Commoners Club attempt to rescue Reiko .Kare was fun beng so OP especailly dealing with that mech like One Punch Fight / Shiometa when she loses her clothes. Eventually they get to Reiko when there is a misunderstanding Reiko thinks Kimito wants to marry her. Karen takes out the Mech and looses her clothes ! Hakua Hacked Hoverboard / A play on words . And Merry Christmas to you, as well!! I likewise agree that this was the best fight of OPM—as it should have been! Oh my gosh, these are amazing. It’ll be out on Wednesday! Just a few things left to finish up! Episode of The Week 12 / 13 FINAL / Had to add because they were good! Even though the season even the final episode didnt have an abundance of action it was the emotions / results that got to me ! Reisi on the Brink of losing control with Seri ready to take him down. Anna / Ghost of Mikoto / Yata and the rest of Red Clan ready to play their very big part ! Nagare is surprised Shiro Neko made it but stiil dont bekieve they can stop the Dresden Slate. Kuroh / Yukari square and Anna release The Red Power which they use to penetrtate the Slate. At the same time once the power reaches Shiro tries to demolish the Slate using his Silver Sword of Damocles but Nagare strikes Shiro down ! Kuroh usees the Red power to finish off Yukari but doent kill him . He reaches Shiro just in time to wound Nagare and the silver sword comes down and destroys not only the Slate but all words which take the King’s power also. Nagare collaspes and dies / so does Shiro who is in another’s body . Iwa is stiil alive but has his jungle crew denolish the Bldg. Iwa stays with Nagare and dies. Bravo outstanding ending episode ! Yato is with an young Ebisu that has no memory of his previous lives. Yato aloso borrowed Kazuma’s wallet to eat ! In a flashback Ebisu is killed by the Gods / Takemikazuchi who is now the leader! Yukine / Hiyori follow Yato amd his pledge to protect Ebisu. Bishamon /Tenjin /Kunimi / Okuninushi/ are having a meeting about Ebisu in which Kunimi takes over for Iwami who was banned from being Ebisu’s confident.They also know Ebisu was just trying to protect through his research. Yato teels Yukine he wants to be A God of Fortune instead of fighting but Yuline tells Yato he is better at killing to protect everybody .Nora shows up but Yato finally dinnises her as his Nora. At the end Fujisaki Kouto ( Yato’s father ) has the brush and has many phantoms with him. In Fact he actually set up Ebisu to have the Gods go after him instead . Very dangerous. Karasuno wins . Before they leave Kiyoko Shimizu goes to check to see nothing is lefy behind but gets harrased by players from another school but Hinata forgets his lunch ( his sister’s ) and tries to intervene . They give him a hard time too until they found out he is from Karasuno and get distracted ! So all ends well! It was a wonderful three seasons and is nice it got completed yet sad it is over ! The main theme of the final that Sota is missing and Inami thinks it her fault ! Whatever the reason Kyoko needs him back because not only he is a good worker but the staff is upset! There is enough laughs from Aoi / let alone the rest os the staff ! The staff are finding their purposees more! But Inami does play a big part since Sota is held captive by his mom for not being honest and the Takanashi sisters are dispached to fight her but they put up very liitle fight ! Inami has a trump card thoiugh a picture of Shizuka as cute young girl. Her anger is at her dead husband and takes it out on Sota / family especially Kozue who is upset about her not remembering her name ! Later Sota takes Inami to a park and both confees their feelings even with a kiss ! Meanwhile back at the eatery all things seen to be settled nicely ! Popura is accepted as the new chief . Yachiyo has given up her sword and ready to move on! This easily one of mu favorite animes / thanks for the laughs memoties ! It was a good episode but felt a little rushed / maybe should have been two ! Plus some of the Seven Seven trumpets but maybe taken out of context! Kureto wants kill all Human / Vamps except humans loyal to him. Guren kiils both sides also but Yu sense his humanity yet. Mirai releases more Trumpets under Kureto ‘s control but is defeated by Yu’s Trumpet of salt ! and is returnes to a more human state? Later Yu, Mika, Shinoa, Kimizuki, Yoichi, Mitsuba, and Makoto are get to leave Japan while it shows the humans won / but thre Vampa are stiil with Ferid or Karr as leader ! The squad wants to rescue Gurem / Mirai Yu walks out into the water im atrange way and says it is starting to rain. Concrete Revolutio doesn’t seem to be the anime we wanted, but it might just be the anime we needed. I really cant go into too much depth as I had to rewatch and digest / but truly stunning. Students vs Goverments all over the world ! Japan and the US exposed on the Superhumans in the Lab. The Superhumans finally siding with the humans! Earth Chan is conflicted and shuts down dies ? Jiro in A crater with a B-29 Wreckage / Hiroshima / A nod to Jiro being a monster?